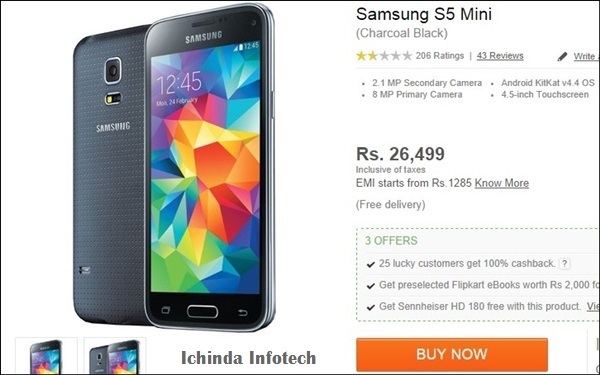 The Samsung Galaxy S5 Mini, the best smartphone for mid-range byers, finally launched in India through online retailer Flipkart priced at Rs 24,499 in Charcoal Black, Shimmery White, Electric Blue and Copper Gold colour option. It’s rivals are Xiaomi Mi3, Motorola Moto X and Oppo N1 Mini. The all new Samsung Galaxy S5 Mini supports Dual-SIM(GSM+GSM), 4G LTE, NFC, Wi-Fi, Bluetooth, GPS, Finger print sensor, heart rate sensor promising superior display with a 4.5-inch HD Super AMOLED display with resolution (1280 x 720 Pixels) and colour depth 16M while for unbeatable multi-tasking experience new S5 Mini runs on latest Android 4.4 kitkat OS browsing with Mozilla and Firefox powered by powerful 1.4GHz quad-core processor with 1.5GB RAM, 16GB internal memory which further expandable up to 64GB via MicroSD card slot. To give you world class, photography experience it’c comes with 8-MP rear camera with OIS (Optical Image Stabilization) with 4K video recording and 2.1-MP front facing camera with full HD video recording and at the end new S5 Mini combines a powerful 2100mAh battery with ultra-power saving mode promising Standby time up to 390 hrs and Talk time up to 21 hrs. It comes in dimension at 142.00 x 72.50 x 8.10 and Weight 120gm including IP67 dust-and-water-resistant technology, finger-print scanner, IR Remote and heart-rate sensor technology.